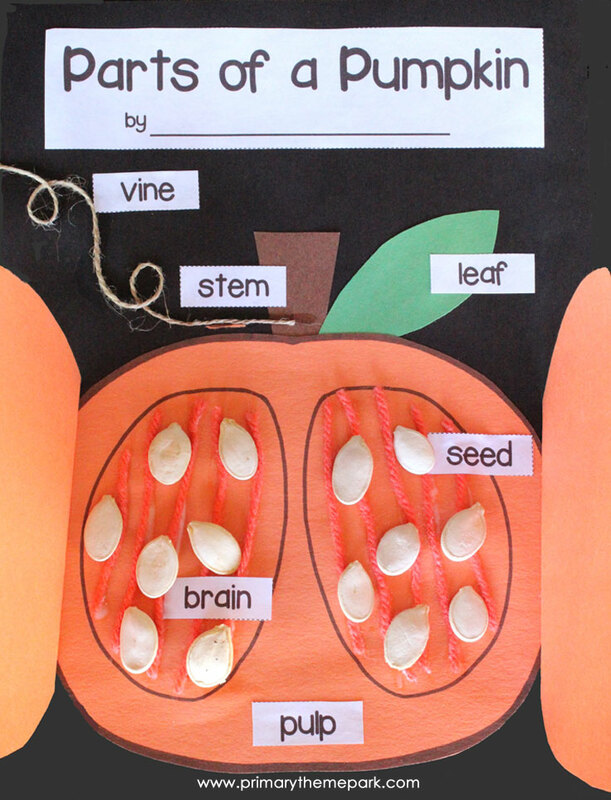 Falling leaves and a chill in the air mean it’s the perfect time to study pumpkins! 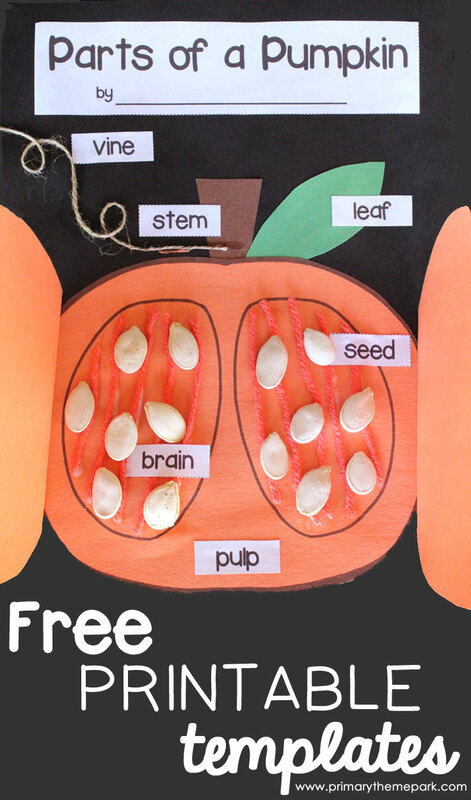 I’m excited to share with you this parts of a pumpkin free printable from my latest unit. We begin by doing a pumpkin investigation. We examine the outside of a pumpkin using our five senses and record our observations. Then, we cut open a pumpkin and look closely at the inside. We again use our five senses to observe the pumpkin. Seeds on the inside, it’s a fruit. Veggies are the stem, leaf, or root. 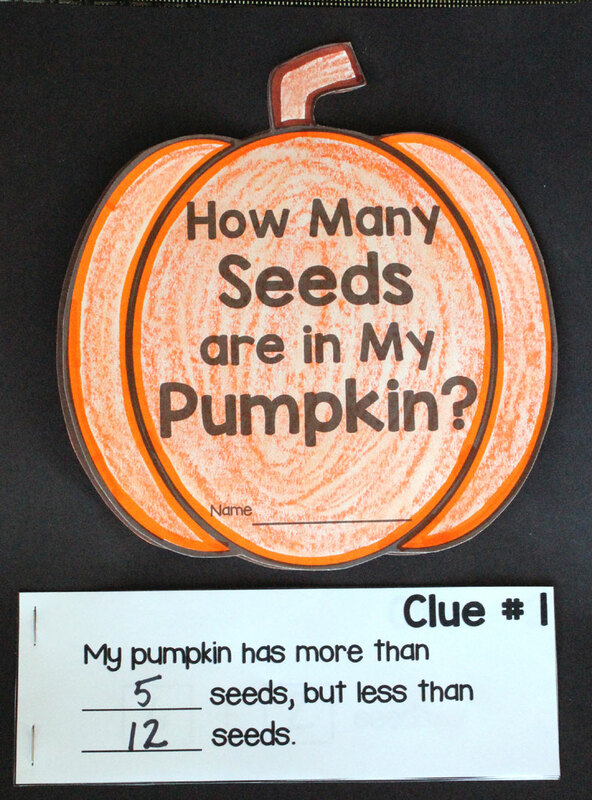 After recording our data, we create this parts of a pumpkin display. 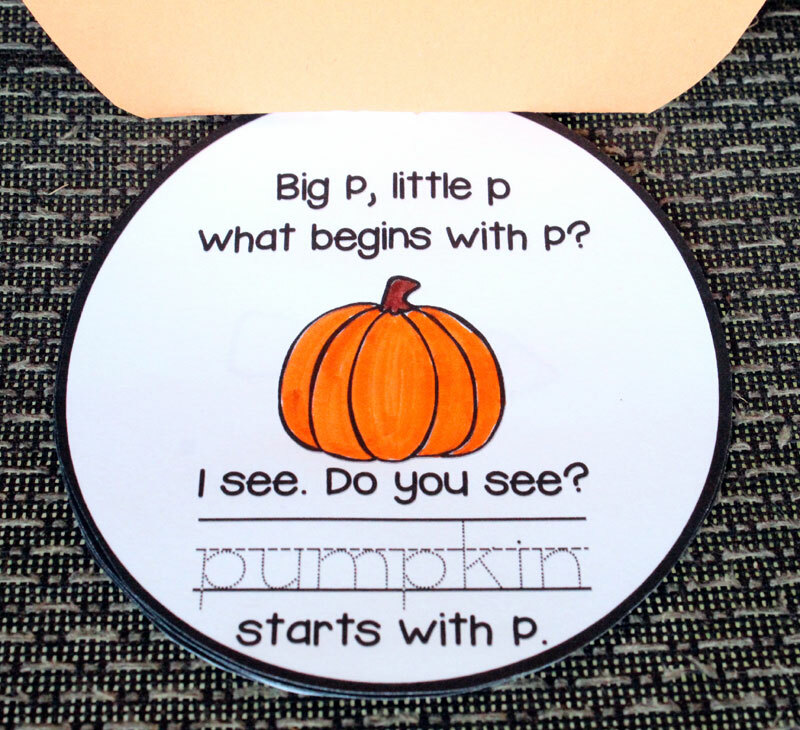 Print the two pumpkin templates on orange cardstock/construction paper. 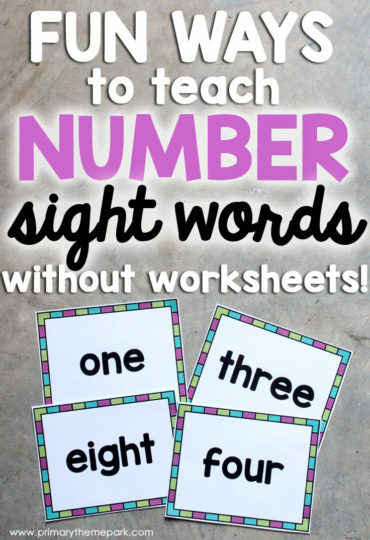 Print out the labels onto white paper. 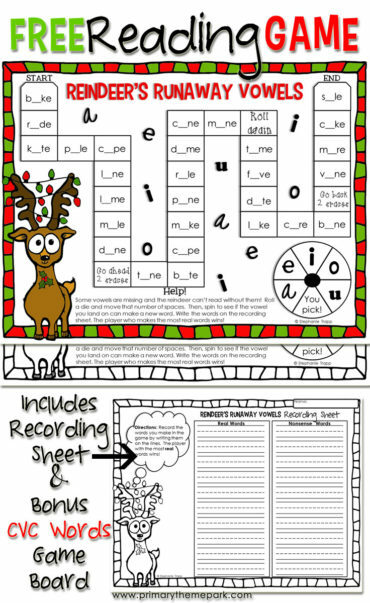 Cut out all templates and labels. Turn the black construction paper in the portrait position. 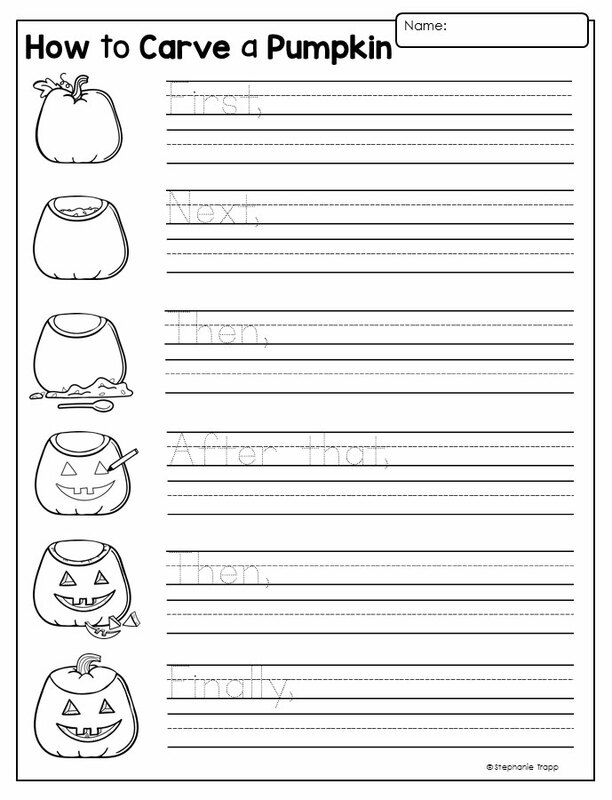 Glue the inside of a pumpkin template at the bottom. Cut several strands of orange yarn/string about six inches long. 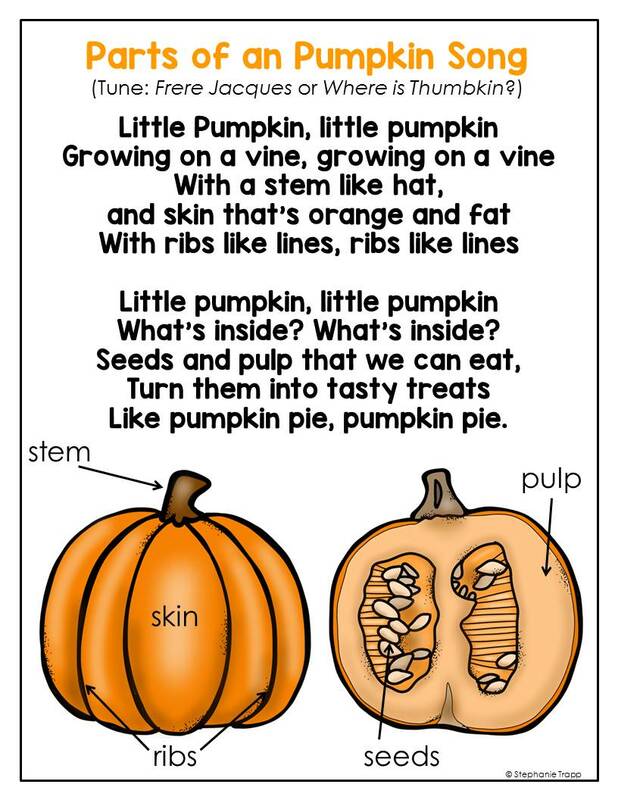 Use liquid glue to glue them into the two circles on the inside of the pumpkin. Use liquid glue to glue pumpkin seeds around and on the orange yarn/string. Allow glue to dry. Cut a small rectangle about 2 inches long and 1 inch wide out of brown construction paper for the stem. Use stick glue to place it on the pumpkin. Cut a small leaf shape about 3 inches long and 2 inches wide out of green construction paper. Use stick glue to place it near the stem. Use liquid glue to add twine or raffia to the stem to create a vine. Cut the outside pumpkin template in two along the dotted center line. Glue each pumpkin half on top of the other pumpkin, only putting glue along the outer sides. The halves open outwards to reveal the inside of the pumpkin. 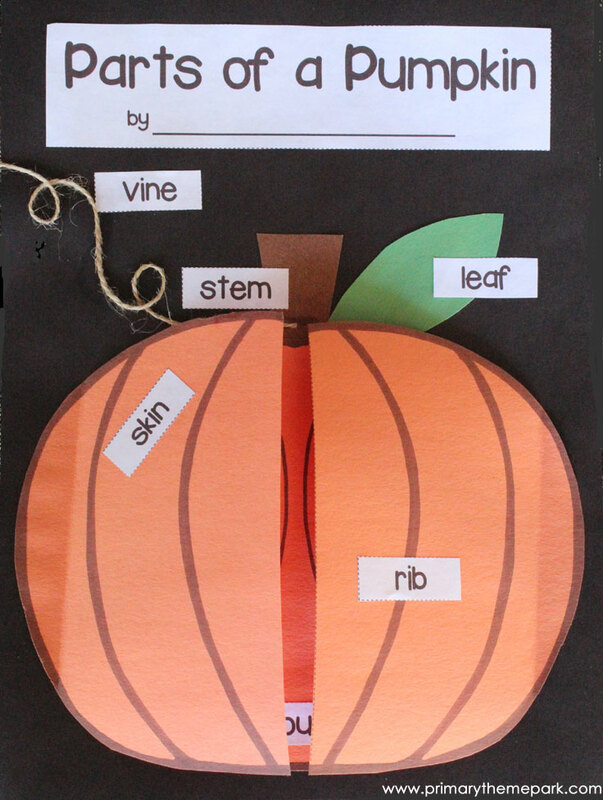 Use stick glue to place the labels on the correct parts of the pumpkin. 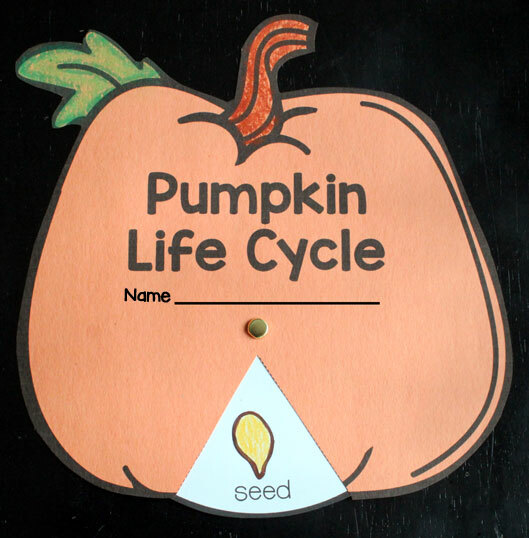 After learning about the parts of a pumpkin, we move on to learning about the life cycle of a pumpkin the next day. 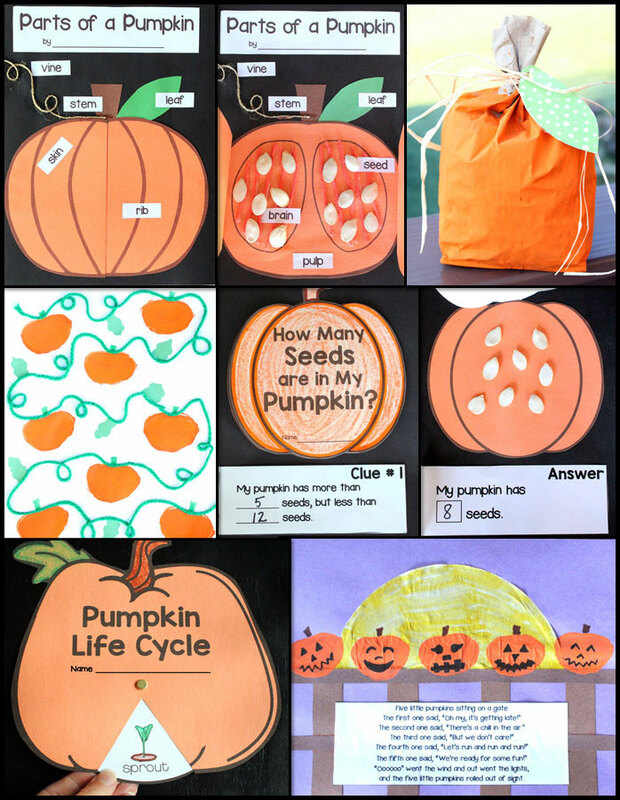 This pumpkin life cycle wheel helps students recall and retell what they’ve learned with family and friends. 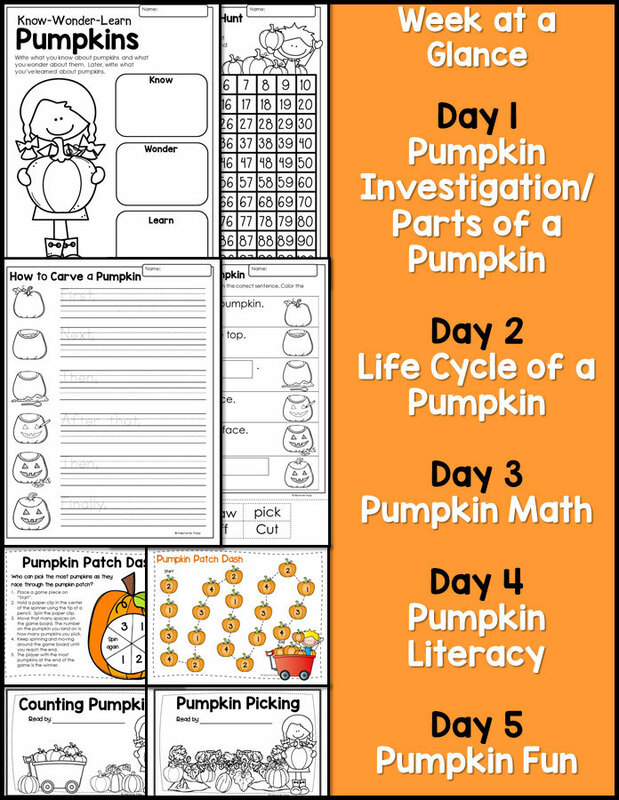 Days three and four of the unit engage students with pumpkin math and literacy activities. 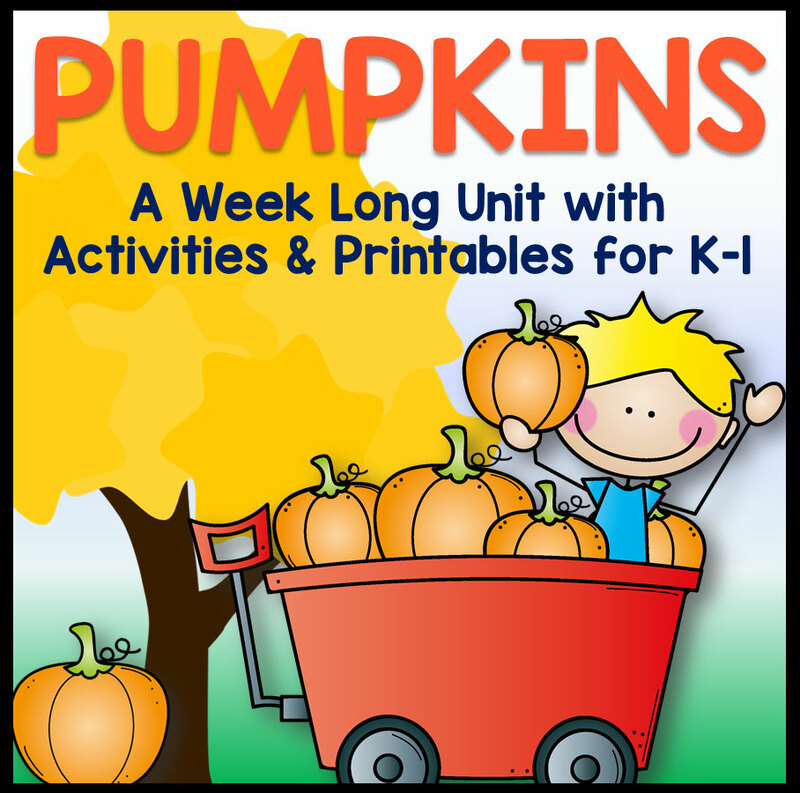 The last day of the pumpkin unit focuses on pumpkin fun! This is the day for tasting pumpkin treats like pumpkin pie and pumpkin seeds, as well as playing pumpkin games and making pumpkin crafts. 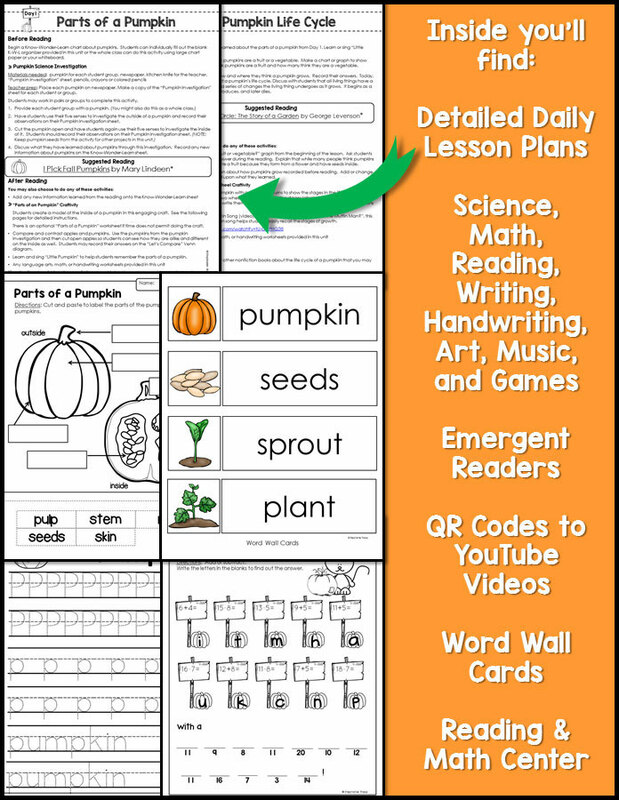 All of these pumpkin activities and more can be found in my Pumpkin Unit for Kindergarten for Kindergarten and First Grade. 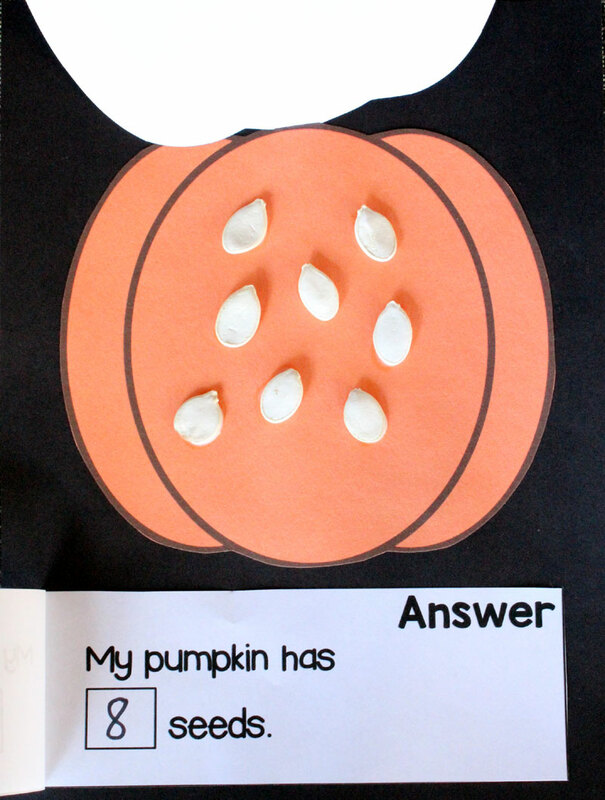 I hope you enjoyed learning about our study of pumpkins! 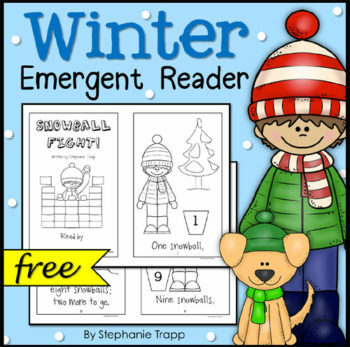 You can download the Free Parts of a Pumpkin Craft by clicking the picture or banner below.